This double-breasted vest sports an elaborate military-style trim on the front, 18 antique gold buttons and faux leather shoulders. Matching antique gold zippers cover the side pockets and the full-length front. This stalwart double-breasted vest harkens back to the days of the French Revolution but has a modern flair. Made of a soft poly-cotton black fabric, the vest sports an elaborate military style trim on the front, 18 antique gold buttons and faux leather shoulders. Matching antique gold zippers cover the side pockets and the full-length front. It is descriptive and lists zippers so it shouldn't be too much a surprise, but it was meant to be more a steampunk garment which puts it into the late 1800's - early 1900's, around the time of the zipper making an appearance. Maybe the title threw things a bit referencing some history. This is more for a steampunk/alternate history. Sorry, it was not more clear. This vest is made of cotton velvet with polyester lining. Features gold and black trims decorated in a Napoleonic style and 18 antique brass buttons. Adjustable back strap. Dry clean only. 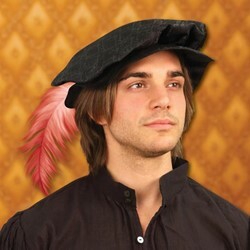 This Tudor bonnet is a soft crowned, round brimmed cap made of strong cotton fabric. Can be worn by men or women. With assembly, this light polyester-cotton blend piece works as a hoop undergarment that accents the fullness of your Renaissance gown, with or without the bum roll. This over vest is made of a cotton canvas and is accented with faux black leather and a lace-up front. Features a Metal “D” rings on the front and a side zipper. This Black Royal Doublet featured is made of faux leather and cotton velvet. Dry clean only.